Here's the schedule for my presentations, hope to see ya there! Roll-up your sleeves and get ready to dig deep. Ninety minutes of undivided attention from productivity expert Jason Womack means that you leave this session with answers to your toughest time management challenges. Jason understands exactly how the gadgets and software designed to speed us up can actually slow us down. He’ll show how to take control of the tools you have – Outlook, Blackberry, iPhone – in order to take control of your day and your professional future. How do you put it all together and make life and business work in harmony? We wouldn’t let you leave Vegas without tackling this thorny question. Learn from productivity leader Todd Duncan as he and Jason Womack share the strategies you need to effect change in your business, your life, and your future. Get armed to tackle your Business Plan and take the next steps to your best year ever. Pennsylvania Station, NYC on my way to Boston! Maybe it's the feeling that for the next [ # ] hours, I will be taken care of by someone/a group of professionals who have dedicated themselves to effectively and efficiently getting from point A to point B. Maybe...I enjoy seeing things outside of normal, routine, or expected. I enjoy finding a new book, talking to someone I just met, or simply taking advantage of a little bit of time to relax, meditate, think, plan, innovate, connect...you know, what most people do when they say they're "doing nothing." If I wait until the last minute to make plans, I run the risk of spending more money for the tickets. If I try and do "one more thing" at the office or in the hotel room, I run the risk of stressing myself out trying to arrive on time. If I EXPECT things to be, go, or result in a specific way, I run the risk of dis-appointment. 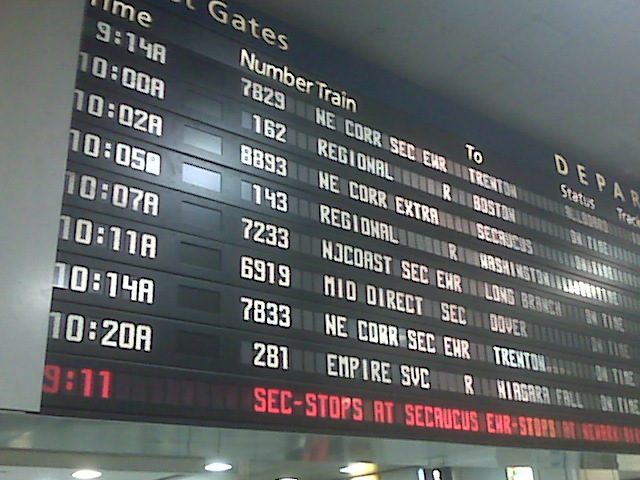 So, instead of living a risky life...I'm here by 'bout 9:20am for a 10am train to Boston. See ya there! While walking through the Metropolitan Museum on Saturday, I had the opportunity to pause...nay, stop...and reflect on many of the personal and professional forks in the road that lie ahead...of us all. 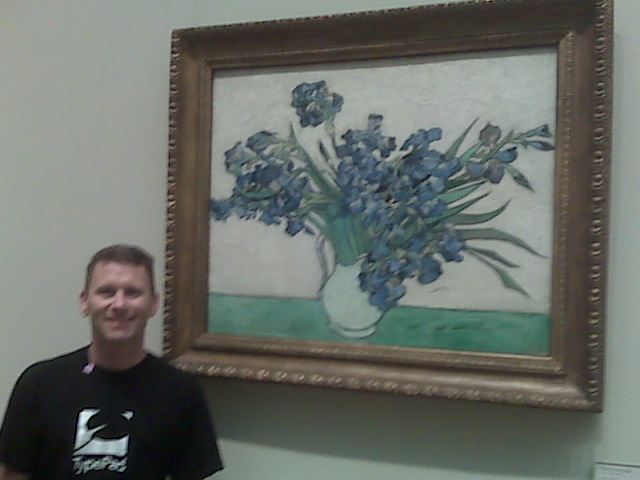 Saw this painting, and froze in place - working in my mind to answer the question: What's next? So, here's to another three months (can you believe it's already the end of September?) of looking around the corner! 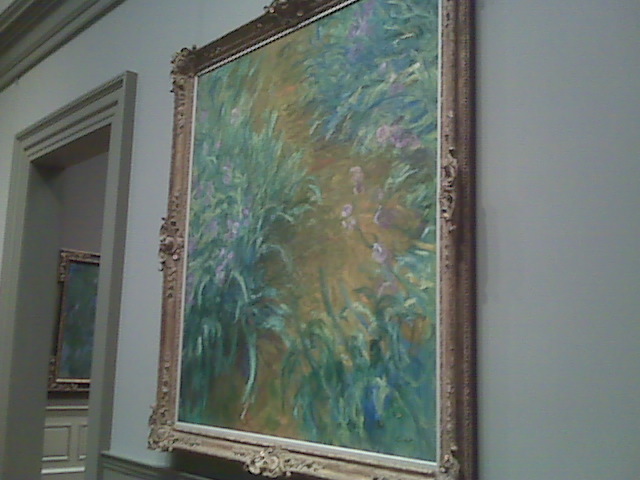 Well, the Met was as amazing as ever today. I got to see it again through the eyes of a "first-timer's" visit. Joe Bruzzese had some meetings here this week (www.thinking-forward.com) as he is preparing some presentations for the United Nations International School as well as a couple of NYC banks. While at the museum, we spent some time in different wings...I still find my favorite to be the marble-carved statues! We're off to see Avenue Q this evening...it's gonna be great! Are You Staying Connected to What's (and who's) Important? Yeah! A new article just went "live" on a website out there...one we put together to share some ideas on how busy, busy people can still "find time" to stay connected to the important people (and things) in their lives. Here's the intro, click below to read the rest of the article, Staying Connected to What's (and who's) Important! When you are traveling and networking for business, you're capable of meeting many people who can and will be important to your business and your life. Once you've left them, sometimes across the country, they and their importance to you can quickly fade from memory. About to start another Friday! What better way to end the week, than a seminar on Performance! Well, the room is set up, a little music is playing in the background, and I have a "sliding quote-show" going...just waiting for the first few seminar attendees to arrive. ...Put off responding to an E-mail request, because you were waiting for information from someone else? ...Listened to a voicemail that someone left you, and had no idea what they were asking for? ...Got up, left your desk, walked across the office to talk to someone, only to get there and not remember what you wanted to ask? ...Today, we'll discuss delegation of actions and projects, and how to speed up the "get-back-to-you" process. ...Today, we'll demonstrate effect query-making activities to manage requests for information. ...Today, we'll identify rock-solid strategies you can use to develop, track, and complete the actionable ideas you have! Welcome to Mastering Workplace Performance...The Seminar. 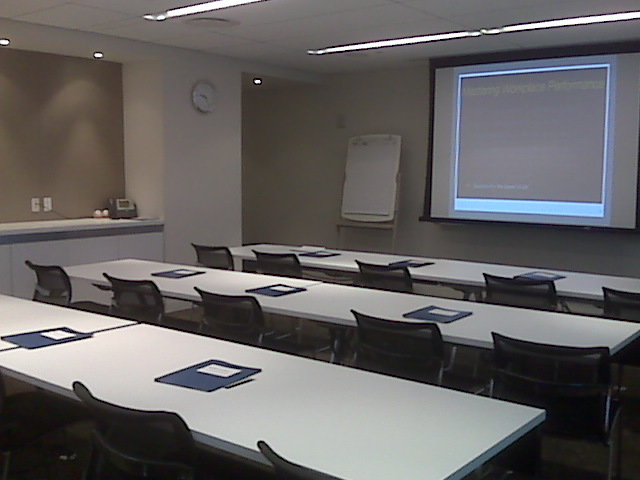 I was one of the attendees at the Seminar given by you for the new analysts at [investment bank] in New York in July. I just finished a book that you had recommended (Why Smart People Make Big Money Mistakes...) and found both the book and the topic (Behavioral economics) to be great! Its one of the best books that I have ever read. I'll definitely try and read more books on this topic. Thanks for the wonderful seminar and the the great book recommendation. I was given the book P.N. mentioned by a client some time ago (most of the books I read come on recommendation by friends, mentors, clients...). I read it with interest, and even as someone with a little economics and finance background really learned a lot about investment behavior and the psychology of risk and reward. Does categorizing (action, reference material, ideas) really make us more efficient? There are many very specific ways of analyzing ideas and information. While you’re working, there are three main areas of focus you bounce between – giving more or less of your focus to each “type” of work, while simultaneously reprioritizing what you still need to do, weighing that against what you are doing right now. I believe that at some level, most people do some kind of combination of many types of categorization of their tasks. Probably the most COMMON type is what I call EXCLUSION. That is where you make a to do list, and just leave stuff off the list! For a multitude of reasons, people don’t want to see, think about, be reminded of or give any of their attention to the myriad of things they are not going to do. Question: Does excluding things, leaving them off the list, but bouncing around in your mind, make you more efficient? And, if so, are you being most effective [that is, working on the most important thing at any given moment] throughout the day? Allow yourself the gift of writing everything you think of on a piece of paper (or, as the case may be for many of you reading this, pieces of paper!). It is statistically significant that we have many thousands of thoughts pass through our minds, day in and day out. By identifying them, you can begin to see which ones will need more or less of your direct attention. Track your use of your time. For a week, place your attention on HOW you use your time and WHAT you do with your time. Before you get deeply engaged (or too attached) to “just changing to something more productive,” we highly recommend you take a look at what you are doing already. The most objective way to do this is to set up a video camera and record yourself working for 60 or 90 minutes. Then, at the end of that time, you can go back and actually see how much time you spent on each e-mail, how effectively you use your computer keyboard and software programs and, what kind of time you are using on the phone. "Home Office Classroom: Keeping Brain & Business Fit"
If you know anyone who works out of a SOHO (small office/home office) please forward them this article on getting the most out of your home office. Thanks! The question was: "In the past six weeks, what tools have you used to support yourself on the job? Select all that apply. I am so inspired that every Mastering Workplace Performance Seminar I present addresses these issues, and provides practical solutions to handle the very areas people work in each day. I always remind people that whatever they do is working (it got them to this point), and all I will do is offer some ideas of how they could potentially move forward in maximizing these tools to be more productive in the same amount of time (or less! ).